A team of 41 volunteers from all departments replaced the Island Store Warehouse on 24th February 2016. Photo of the completed warehouse roof. 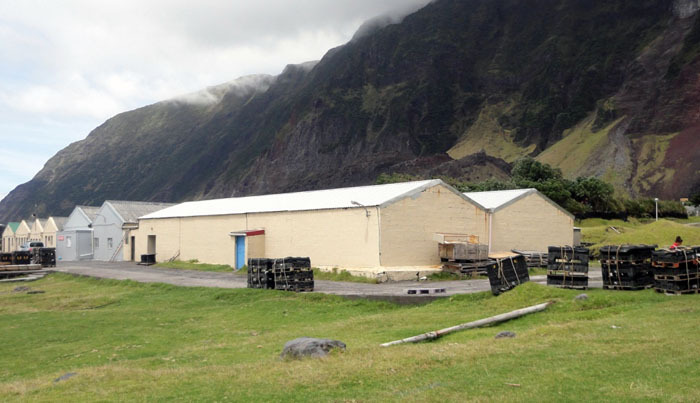 The large warehouse section of the Island Store is critical for keeping all the food stocks and life support supplies for the islanders in a good condition. The alarms and fire extinguishers were upgraded before the Christmas break but the warehouse roof leaked like a sieve. Roofing sheets installed many years ago were made of painted steel but due to the environment they deteriorated rapidly. Creeping rust was eating its way from the four bottom edges of the two roofs and degrading each holding bolt so that both roofs leaked and had to be dealt with. The Aluminium sheet was provided over a year ago but due to other priorities and changes of staff, it was never installed and the ‘warehouse makeover’ remained an outstanding critical task. PWD under Jonathan Repetto led an ‘All Hands” day on Wednesday 24th February 2016 with 41 volunteers from all departments. We even had Heads of Departments, leading from the front, working on the roof and preparing roofing sheets etc. The teams started removing old sheeting at 07.00 and by 13.00 the task was complete, just in time as rain began to fall as the last bolts were screwed home. Above: Cutting the corrugated roofing sheets. In total, 168 roofing sheets were used. They were 73cm x 3.9 cm and without overlap would cover 478 m3, which is equivalent to four small houses. 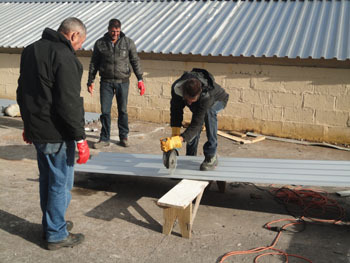 The teams were split into seven units: Preparation, which involved cutting roofing sheets to the correct length. Two teams of old roof removal, one on each roof removing the old sheets. Two new roof teams, one on each roof, installed the new panels with two teams carting away the old sheets with tractors and trailers. End barge boards were added and the roofing ridge sheets applied with seals to prevent rain being blown under them by the extreme winds experienced in the winter. The teams are now equipped with good quality electric hand drills and with good planning, it went like clockwork. The island has no scissor jacks but careful use of JCB buckets allowed the operation to flow evenly with each team observing safety at all stages. after they had cleared the site and congratulate them on behalf of everyone on the island on a job well done! and they have produced excellent results on this latest project.